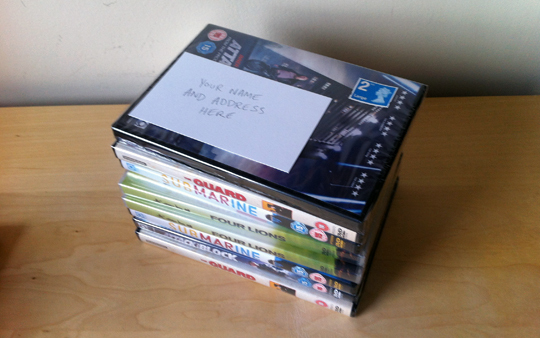 First come first served: who wants these Studio Canal DVDs? The lovely fuckers at Studio Canal very kindly provided us with a load of copies of Attack the Block, Submarine, Four Lions and The Guard to give away at last week’s Ultra Culture Cinema Sightseers screening, but for some reason most of them ended up in my bag at the end of the night along with a brutalised lettuce and an off-date celeriac (don’t ask). Luckily I’m an charitable sort of fellow so rather than sticking them all on eBay I’ve decided to give them to you, dear readers, on a first come first served basis. This morning I went and bought eight 2nd class large letter stamps, which I have now affixed to the DVDs, so to get your hands on a random selection from some of the best films of recent years (and The Guard) just e-mail [COMPETITION OVER, PLEASE STOP E-MAILING] with your name and address. Please don’t request a specific film. You’ll get what you’re given.